1. Let Your Inner Critic Take Over: Self-doubt is a motivation killer and it can trick your mind into making you stop the progress you’ve made. It wants you to fail; it wants to take away your hard work so you do something else with your time, like take a nap. If you have passion for your writing, you need to stay the course! Just showing up counts more than you know, and it can be the difference in success with your work or letting your inner critic take over. When you feel you’re stuck, or you’ve lost your train of thought, step away for a moment and clear your head. Then come back to it stronger than ever. 2. Fail to Keep Your Readers Engaged: Boring content won’t translate into readers or revenue. Always look for new ideas to spruce up your writing to keep readers engaged until the end. Offer a CTA (Call to Action) by giving instructions to try something on their own. They need to feel your energy and respond to your message. Your writing needs to stand out in the best possible way by giving your audience knowledge they cannot get elsewhere. If you’d like to read a few excellent ways to write quality content and stand out in your niche, have a look at this blog. 3. Write and Edit at the Same Time: There’s a reason why there are first, second and final drafts in writing. You don’t need to get everything perfect right away. Unless you’ve been publishing at an expert level for years, you should use your time wisely and stick to editing after your content is written. Get your thoughts down and sort through the format at a future date. When you’re worried about how each sentence sounds right away, your mind loses focus on providing the best tips. Write first, edit later! 4. Forget to Track Your Results: It doesn’t matter if you’re writing as a hobby or professionally, sooner or later every author wants to see results. These results can range from money, readers/followers, improved reputation or other personal gain. You don’t have to be a mathematician to track your earnings, and social media provides so many tools to keep us informed of how our actions are being received by others. Make it a habit to track your results and adjust your methods according to the rise or fall in stats or viewership. 5. Add Too Much Irrelevant Detail: While it’s important to include the necessary details in your writing, too much background information on the subject can turn your readers off. If you’ve fallen asleep while hearing a lecture that never ends, you know the feeling. Your main content should be directly relevant and straight to the point. Avoid dragging on with details on subjects that have little meaning to the overall theme. Keep it short and simple and your readers will respect you for keeping them interested. 6. Publish Before You’re Ready: A writer needs time to go through their content to make sure all bases are covered before it’s published. When you think you’ve finalized your writing, grab a friend of co-worker to check out your work. An extra set of eyes could spot an error or a confusing sentence that sounded perfect to you. Timing is also important in publishing. Do your research and find out what time of day or week your readers are the most active. This blog highlighting 7 Easy Article Submission Blunders to Avoid will help you double check important areas prior to article publishing. 7. Stop Learning When You Know Enough: Most of us are guilty of overthinking situations, depending on the circumstances. However, learning too much on a topic is NEVER a bad thing. If you ever feel like you’ve achieved the highest status you can in your area of expertise, a reality check could be headed your way. You should never stop learning in your field, especially as a writer, because you need to continue feeding new information to your readers to keep their attention. 8. Stick with the Same Niche Forever: If you absolutely love pizza, by all means eat pizza, but you simply can’t eat pizza every day without developing a craving for something else. If you have a very specific set of skills that fall under one niche, continue focused in this area. However, the best authors slowly branch out to other topics and explore new avenues they never thought they would experience. Remember, the quality of your writing matters the most, so only test the waters elsewhere when you feel comfortable enough to provide valuable content to your readers. 9. Tease Your Readers and Never Get to the Point: Think of a movie or TV show that ends abruptly without clarifying questions from the story. It can be upsetting and may even ruin your day! Don’t try this if you’re giving your audience tips and advice. Your goal is not to be a brilliant storyteller that keeps your audience wondering forever. They’re taking the time to hear what you have to say, so it’s crucial you satisfy their craving for useful material. 10. Quit if Things Get Tough: Everyone makes mistakes from time to time; that is a fact. The important thing to remember is: you’ll never meet your goals if you give up on them. It doesn’t matter if you’re just starting out or if you’re going through a difficult time in your already established business. When the going gets tough, the tough get going! Believe in yourself and your abilities, acknowledge your fear and face it head on. How many of the mistakes listed above have you been guilty of committing? Any one of these could strike at any time, thus delaying your writing goals. Overcome these mistakes by staying motivated, writing engaging content, and trying new approaches. 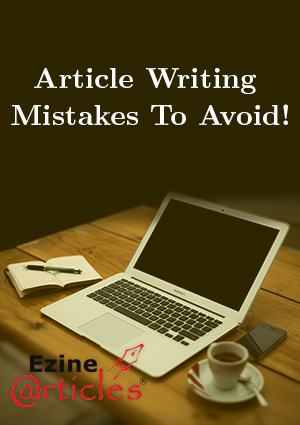 As long as you can admit and learn from your mistakes, you’re on the right path to article writing success! Do you have any tips to overcome these mistakes? Feel free to share your thoughts in the comments below! 11. Write without a plan. Sometimes, yes, you just have to grab an idea and write till it’s out. But then, use the huge bank of advice on this website and PLAN how you’re going to use it. With most articles, you’ll have an aim in mind when you begin to write, even if it’s a little nebulous. Before you get very far, PLAN how you’re going to develop your good idea or reach your objective, then follow the plan through the first and second drafts. Then pause, lay it down and come back later fresh to complete the article. Thank you. I have placed yor article in my swipe file for future refrence. Recently, I started writing short online articles. For many years, I have lacked confidence in my writing skills until I first published my first article. I have been writing more ever since. I think confidence of sharing a fact and how deep one can think for a particular topic is the main feature of an expert writer. Its not an easy thing to achieve, only with more experience & time only one can reach up to that. Never give up on your dreams or ideas. I never quit over anything that has to be done. Will to succeed in anything will stand in good stead against any odds. Any sincere author is bound to publish good thoughts and ideas. The list given in this post is good advisory for an expert author too. Awesome! A must read Article for one aspiring to great in writing ability. Information is the key to knowledge, and Knowledge is power. Take from the professionals and build your success.EzineArticles Platform is the right source for positive information. I love this keep it up. Interesting. I think i will focus more on the 9th mistakes to avoid in my writing. Thank You sir .. I really Needed this. It is my first day here. Thank you for the very resourceful and eye opener article. It covers all the angles for a blogger, novice or expert. As far as writing outside of your primary niche requires little more explanation. Can we do that under the same authorship or need to change the name or the format of one’s name? Can we have more than one Ezine accounts with different author names? Any suggestions or thoughts? Thanks for your comment. These tips are meant for authors with any amount of experience! You are free to submit articles in any category as there are no guidelines on how many niches an author can write about. However, per our Terms of Service, we only allow one account per person. You may add an Alternate Author Name to your account at any time. If you would like more information on Alternate Author Names, visit our blog on the topic here: http://blog.EzineArticles.com/2012/07/a-guide-to-managing-alternate-author-names.html#more-22767. If you have any questions regarding your account, please contact us in Member Support and we will be happy to assist you further. Thank you for this helpful sharing. This is very helpful for me as I am a new blogger and this will help me on how to write. From these no 3 and 4 are common with me and now i am trying to overcome with it. It would be a big mistake to ignore the facts expressed in this article. Thank you very kindly. This article is the pathway to success as an author who desires great achievement. Keep it up. Great article for sure! I think the only person that has gotten to his zenith in doing anything is the dead man in the grave. Really as a starter, I’m sure I have a lot of like minds to learn from. Thanks a million. It would be a great mistake if you don’t follow the facts explained in this article. Really worth it to read this article. Great tips for new authors. These tips can set up a guidance for better writing. Appreciate the article! I wrote seven articles and had two accepted four rejected and one is waiting for inspection. At the moment I doing corrections, and it is like school is in session and I am learning from my mistakes. If writing was easy I wouldn’t be interested. Because there is no joy or excitement in things that are easy. That’s spot on, Andrew. It takes all of us a while to (a) master the EzineArticles system, (b) rack up to the standard of presentation required in our articles, and (c) learn how to interact with our editors. It IS a bit like going back to school, or being on an upskilling course for professionals, but the results are always worth it. Do read the helpful articles like this one, which make the task easier, and don’t be discouraged by needing multiple tries to get up to the mark. Once, as a young High School teacher, I was commissioned to write a course for kids of lower ability (very low, needing specialist help) and I found the worksheets and instructions for them particularly challenging. But the departmental head coached me through it, and after SEVEN tries, each a little closer to the mark, I got to understand how they thought and wrote what they could use. I then knew why a typical textbook was useless to them! It’s not a lot different learning how to ‘speak’ to any readership; that experience was formative for me – and humbling. I was SO sure of my ability, you see, and had not thought to put myself in the target readership’s place – very different to mine. Thank you for your comments and also, the story about the students. From the story, I learn that it is best to use simple and clear English to communicate with others, instead of high-styled words. By the way, it is like a struggle waiting to find out if my article has been approved. Anxiety is getting the better of me. Do you have any other tips? Keep writing first drafts, Andrew. Your submissions will most likely come back to you with procedural or protocol errors, but as you learn from getting these corrected, so your new articles’ second drafts can incorporate what you learn. And do keep reading the help articles from the ‘Categories’ list in the right column here. Find something new and useful from at least two of the categories every day. Also, read short articles and other works, both in your own specialty and of other kinds, looking for tips on what to do – and what to avoid! Thank you, David, you sound like a very wise man. Great advice and I will follow it. Cheers! Your visible approach shouldn’t simply be a representation of your brand name, but include it. A observable technique is what provides your brand to life in your entire connections and online engagements. Effective writers don’t gain a living through the sales of only 1 book.